“These tunnels will contribute to facilitating movement of worshippers and visitors who pass by King Faisal Road and ensuring their safety and security,” the official said. The move comes as part of efforts to develop the close premises of the Prophet’s Mosque. The tunnels No. 2 and 3, each with a length of 125 meters, have been provided with escalators for the benefit of the elderly and people with special needs, the official pointed out. They are also provided with 12 elevators in addition to ordinary stairs. “These stairs are designed for the use of people of all age groups including the elderly,” the official said. The tunnels will take people to the northern part of the central region of Madinah without crossing any roads that will be filled with vehicles. The tunnels are equipped with fans and air-conditioners, fire-fighting systems, light and sound systems and security cameras to monitor the smooth flow of pedestrians. The entrances of these tunnels have been decorated with attractive metallic and glass structures. 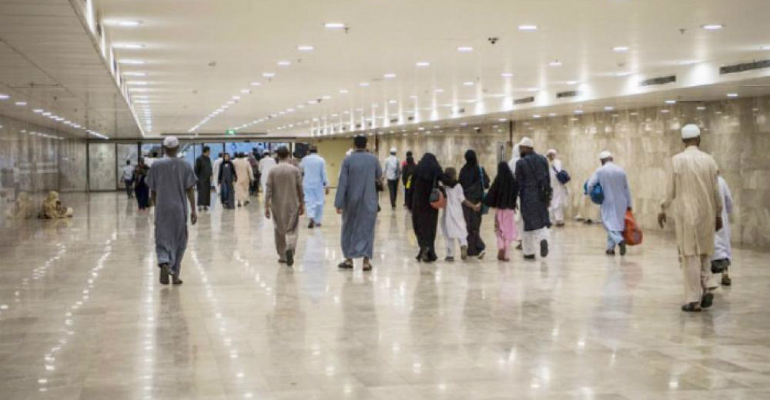 Speaking about the tunnels’ locations, the official said Al-Salam tunnel is located southwest of the mosque, while the Awali tunnel is situated on the southeast, adding that they provide secure passage for worshippers and visitors of the Prophet’s Mosque. The new tunnels projects were carried out under the supervision of Madinah Emir Prince Faisal Bin Salman, who has initiated a number of development projects in the holy city.